Most people call me Rose, but my favourite name is Nana. I am truly blessed to have a beautiful daughter, and two adorable grandchildren. They bring me sunshine and pure delight. Lily is a little white fluffer, my constant companion; a Maltese X with a person inside. She has a gentle nature, and just loves everyone. My husband is very supportive of my creative endeavours - he 'loves' everything I make... and there are others in my family too, who are equally one-eyed and biased! I have been selling on Madeit since 2009. I create scarves and wraps, neckpieces, bags, hats, and other accessories. 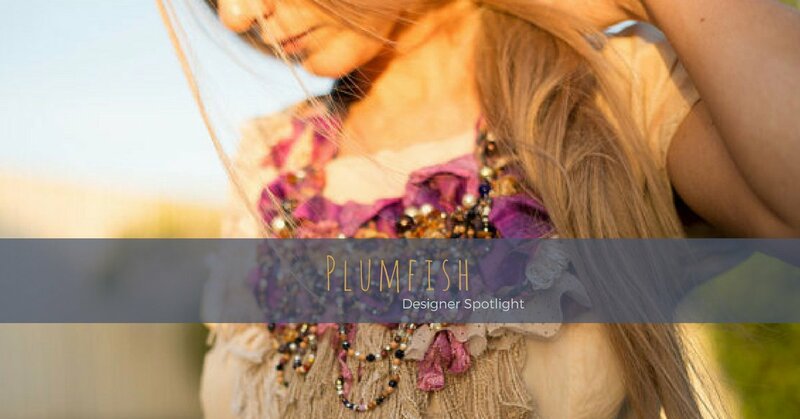 The beaded neckpieces, cuffs, dresses and altered couture in my shop are created in collaboration with my daughter Holly, and under her watchful eye. Holly is a very talented artist and teacher with a Visual Arts Degree. I am retired now, but in my other life, I worked as an Oncology Nurse in a busy teaching hospital in the heart of Perth. My favourite place to sit and create, is on the floor in the lounge room, in front of my big green leather chair. But I can't contain myself... I tend to spread out and take out and take over most of the house. I am always apologising for the mess - be it all a creative mess! There is a sewing machine on the dining room table (and another one in the wardrobe), lots of fabric and lace, threads and buttons and beads. The kitchen bench is used for felting. I have a storeroom - a bedroom really, filled with wool, recycled silk, vintage lace doilies and tablecloths, and a collection of clothes for upcycling. My linen cupboard has boxes of silk, and scraps of every kind that I might need one day! My spinning wheel is in the family room. There are racks of scarves, bags and wraps, embellished clothes, necklaces, cuffs and hats (and other things - but I'm not sure how they got there) and there is pretty, coloured fluff in almost every corner of the house. 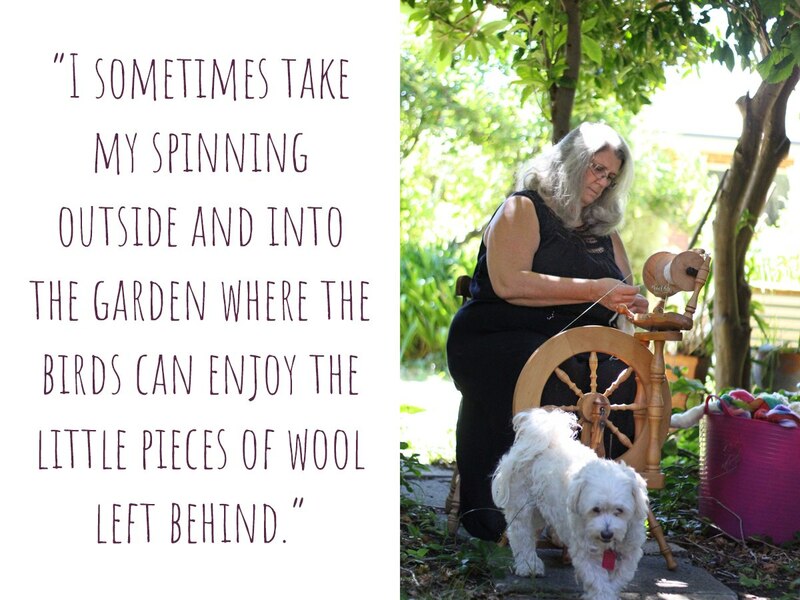 I sometimes take my spinning outside and into the garden where the birds can enjoy the little pieces of wool left behind. Naturally, I have accumulated more than enough stash to last a lifetime - but I am always looking for more. I am often asked about my creative process, and I have to stop and think - is there really a process? If there is, it's a very mysterious one. 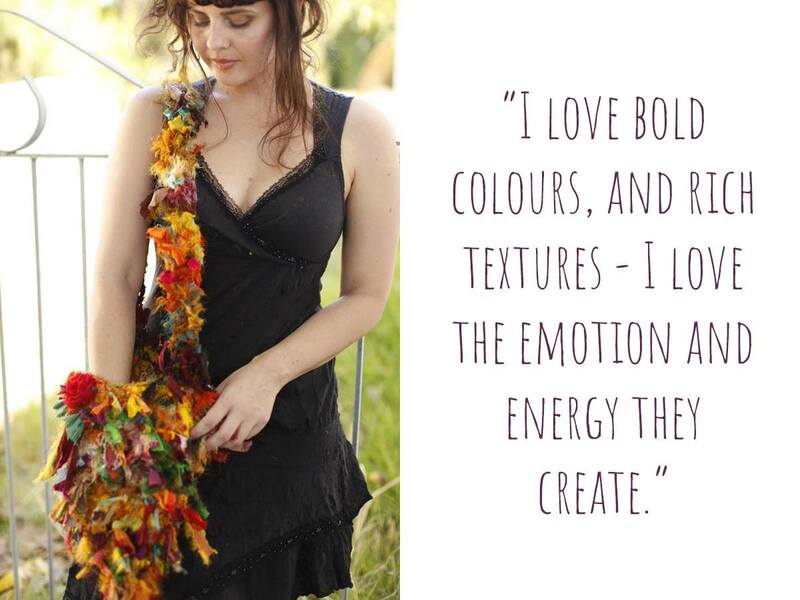 I love bold colours, and rich textures - I love the emotion and energy they create. Holly is the exact opposite, she prefers the subdued and subtle neutral shades - like the understated elegance of ivory, cream and beige; colours that are not quite white but have the warmth of a tiny touch of earthy brown. Holly is also drawn to texture - touch is her most grounding sense. She delights in complex textural transitions. Despite our differences, we work together to create one-of-a-kind textile art that reflects a variety of styles and influences. Collaborative works are often wonderfully surprising, and a refreshing change to working on your own. We both love intuitively allowing a textile piece to grow and choose its own course. We are both enriched by each others' differences and celebrate the way these differences evolve in our work together. Inspiration just seems to happen, accidentally, unexpectedly. It can come in the sunshine or the shadows of the natural world. It can spring forth from within... it can reach you in a dream or vision. 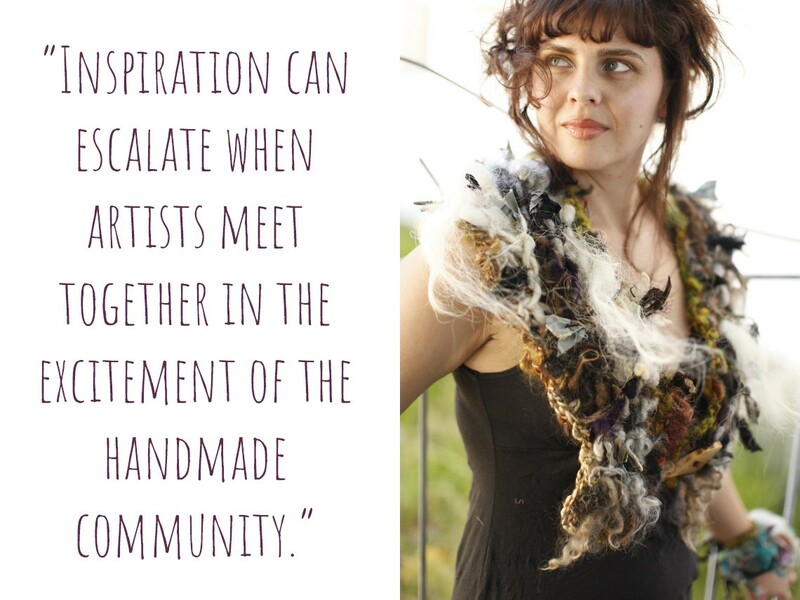 Inspiration can escalate when artists meet together in the excitement of the handmade community. It can be found in the freedom of children’s art, in laughter, enduring love, and the strength of the human spirit. I have always loved to create. In fact, I can't remember a time when I didn't knit, sew crochet or draw. 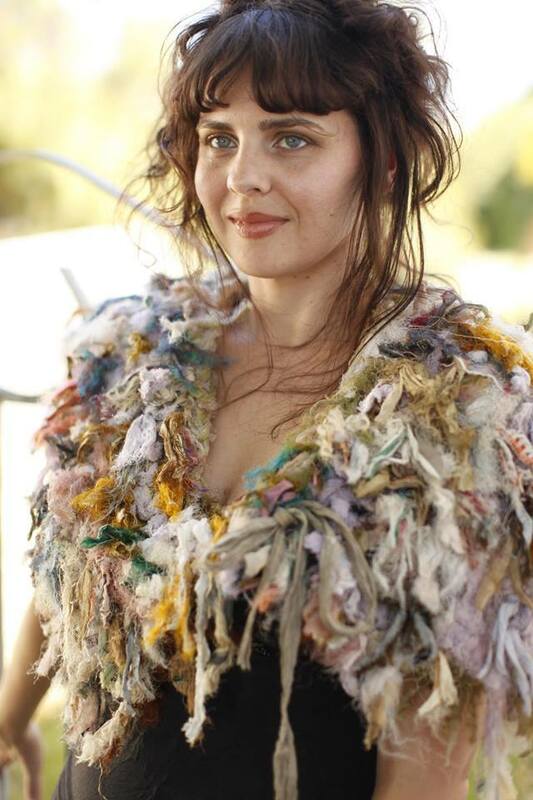 I am told that even before I could speak, I would sit amongst scraps of wool and fabric and entertain myself for hours. My grandmother was an important creative influence in my life. 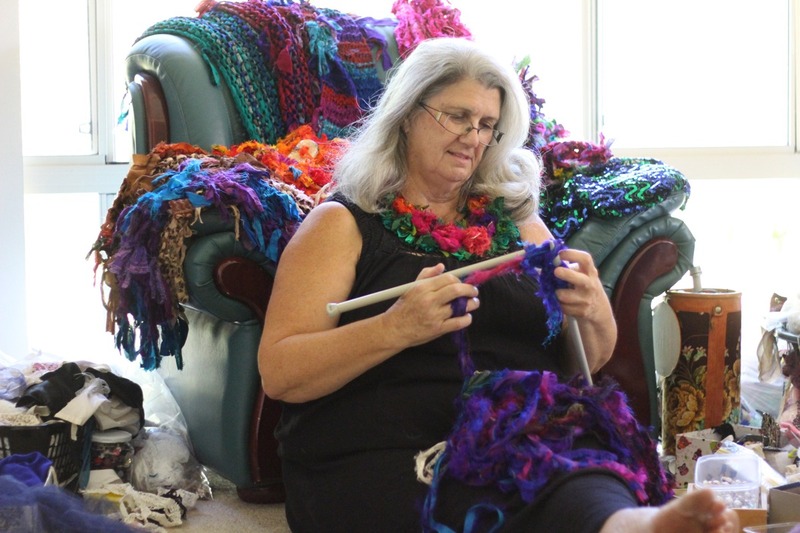 She had the enthusiasm and patience to teach me to knit and crochet when I was very young - but more importantly she shared her fascination with every stitch I created. She showed her excitement and eager anticipation as each piece unfolded, and celebrated every completed work. I used to love sitting and knitting with her, while watching TV on a Friday night. 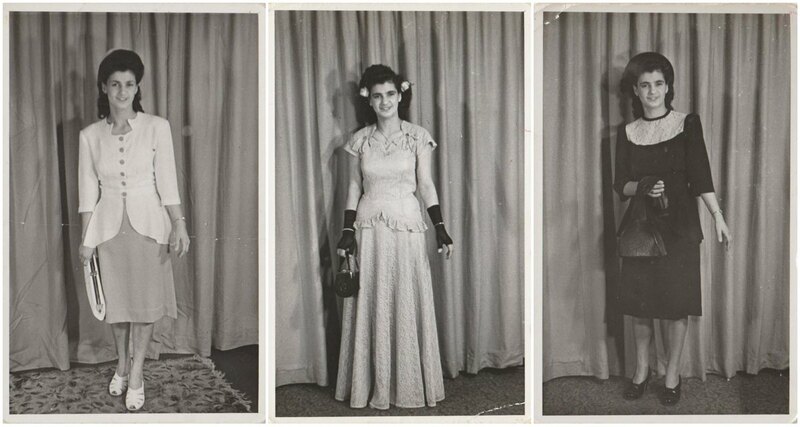 My mother was an amazing dressmaker and designer. She could make anything from a baby's bonnet to an elaborate wedding gown. The quality of her work was exceptional. She was a perfectionist in every way. I learned from the best, but I was never very interested in the 'right', or 'proper' way of doing things. 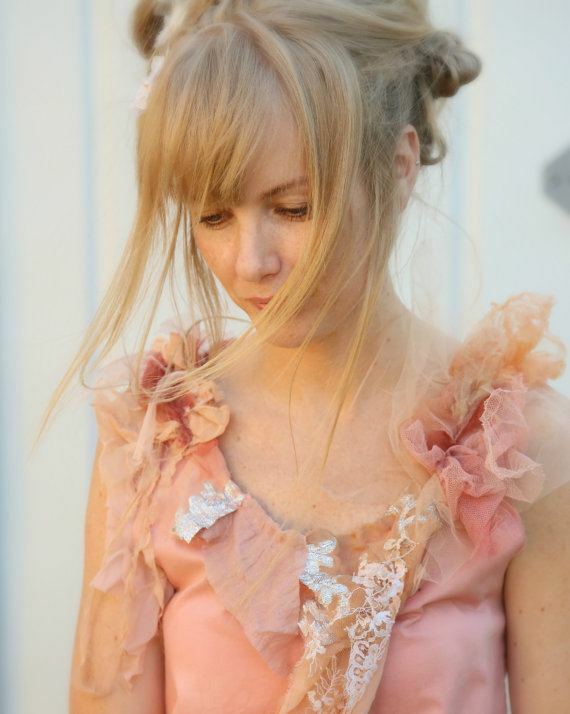 I was always in a hurry, and could never understand why the inside of a dress had to look as neat as the outside. I still enjoy sewing, but I would almost always rather be knitting. In recent times I have learned felting and spinning. I have spent a lot of time beading too - but there is still so much more I would like to learn. I would love to be able to paint like Holly. Madeit is not only a wonderful platform to buy and sell handmade, but a platform that enables you to reach out to like minded people, to network, encourage and support each other - it builds community. And of course, Madeit is uniquely and proudly all Australian. 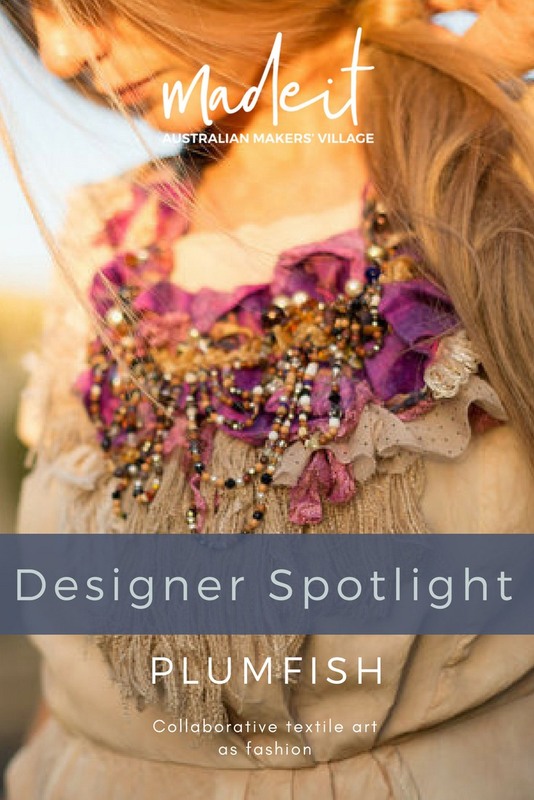 It is an opportunity to showcase the beauty of handmade and to share it with the world. Handmade matters. I love handmade. It offers a piece of the makers soul. 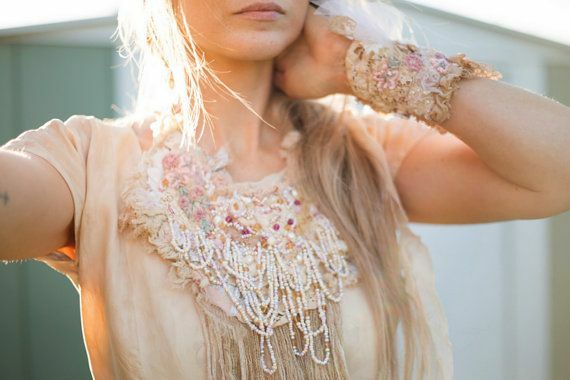 Every handmade item is as unique as the person who created it. It is about love and care, creativity, imagination and passion. 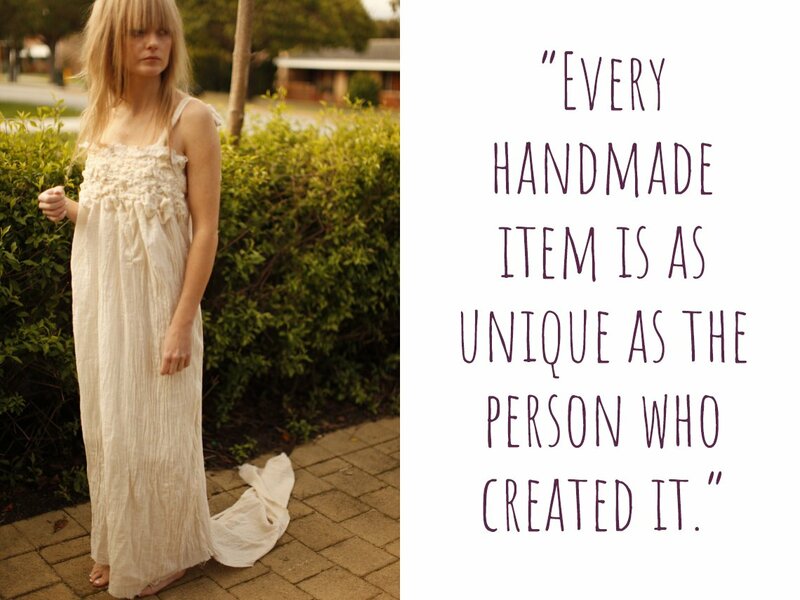 Handmade creates community, enriching our lives and our culture. 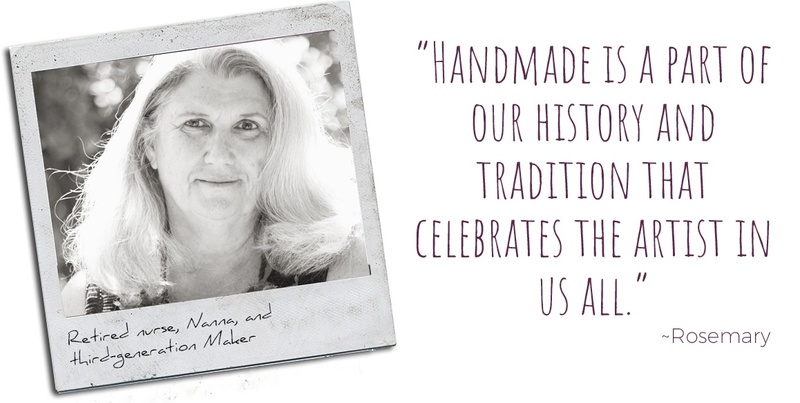 Handmade is a part of our history and tradition that celebrates the artist in us all. There is freedom in it, in creative expression; it can have a powerful and positive impact on health and well being - it can nurture your body and soul.